It happens on occasion that you get a new lipstick, and in your excitement to try the new shade, you twist it up a tad too far to apply. Oops... we now have a broken lipstick! Or you had your lipstick in your pocket or in a warm spot, such as your purse on a hot day or left it in the car and you make the mistake of trying to put some on and oops... it breaks in half. Or the complete opposite since a very cold lipstick can become brittle and also break at the base. This has happened to most of us at one time or another. All is not lost however. We provide the steps to repair that favorite lipstick of yours using a match or a lighter. First Step - Place the lipstick bullet in the freezer for 10 minutes to re-harden the waxes. This will make it easier to handle with less mess. Second Step - Place a glove on your hand to keep things neat and tidy, followed by twisting the tube up completely so you can check the break of the lipstick to match up the broken ends. Check high and low spots on the lipstick. Third Step - With a match or lighter, quickly melt just the top layer of lipstick still attached in the tube. Twist back down. 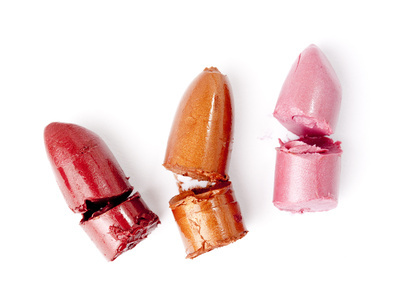 Now melt the top half of the lipstick bullet much the same way. Now use the tube as a guide to gently press the top half back onto the bottom half and hold firmly in place for a minute. Fourth Step - Twist the tube up and down to make sure it took. Now take your match or lighter and slightly melt the outer edge of the joined pieces using a toothpick to smooth together for extra hold and to provide a seamless look. Now put the entire tube back in the refrigerator for 30 minutes. Fifth Step - Once all is repaired, for a cleaner finish, simply take a Q-tip and smooth out any lumps and clean the lipstick rims. Voila... your favorite lipstick is now repaired. If you order on line give your lipstick a chance to acclimate to your home before applying. 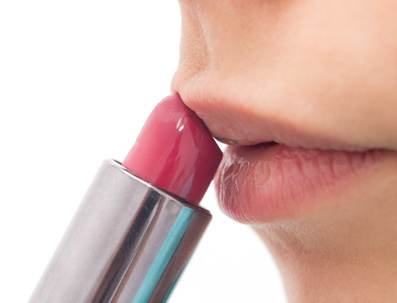 Very cold temperatures can make a lipstick brittle so once you apply pressure to your lips it can snap off it's base. Same goes for very warm or hot days since lipstick can arrive softened especially if left in a hot mailbox. So before applying, place the lipstick in the refrigerator for 15 minutes to help re-harden the waxes. Never untwist your lipstick further than a 1/4 to 1/2 inch past the edge of the tube as shown in this photo, since this will cause instability of the lipstick which will allow it to break. When applying your lipstick we also advise to not use the tear drop angle since it creates a sideways pressure. Place the lipstick tip directly on your lips with a straight in direct pressure which will also help to round out the lipstick avoiding any side angles or misshapen tips that might force the lipstick to also break. Same advice follows even if you have had your lipstick for awhile, since cold and hot days will eventually deteriorate the stability of any lipstick you might use. Take care of your lipstick with some of these precautions and you should be able to enjoy it right down to the bottom of the tube.